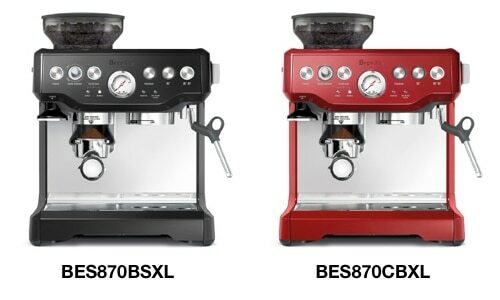 Fresh and fast is the benchmark of the Breville Barista Express BES870XL Espresso Machine. 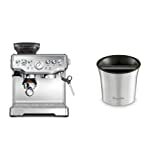 This simple yet high-quality espresso machine allows you to create exquisite espresso shots right at your own coffee bar. It offers just enough control for your aspiring inner barista. It is also practically fail-proof in its simplicity, performing on the level of coffee-shop machines at quadruple the price. Espresso-making has become both an art and a science and requires multiple steps to achieve success. The most common mistake at-home baristas make is purchasing an espresso machine that is much too intricate for their skill set. In striving for success, they end up with an expensive piece of equipment too frustrating to use. You have to adjust each input, decide on the grind, size and roast type, measure the precise amount and monitor the distribution of steam and water pressure to get the perfect temperature. For those who have never pulled shots for a living, this can be overwhelming. The Breville Express is easy! It eliminates the exercise out of the equation, allowing you to experience espresso excellence. Let’s dive in and take a look at the Breville Barista Express BES870XL Espresso Machine review. Built-in storage tray to hold the included stainless steel frothing pitcher, scoop, and cleaning kit: disc, tablets, brush tool and Allen key. For the java novice, the Breville Barista Express is going to make you happy, simply by being wonderfully uncomplicated. In the coffee world, freshness is measured in just minutes. It doesn’t take long for ground beans to start losing their flavor. Grinding beans when you want fresh espresso takes time. For many, there is often a tradeoff between taste and convenience. The Breville Barista Express solves this problem. Thanks to the integrated burr grinder, it delivers fresh quality espresso at a remarkable speed. While other espresso machines in this price range add to the work of already-busy morning, this beauty lets you skip all that hassle. The integrated burr grinder takes you from beans to brew in under a minute. 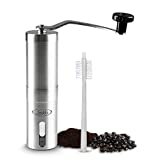 This ensures the freshest coffee without losing the convenience of the super-pricey industrial machines. The control cup allows you to choose your volume. It even comes with a manual override when you change your mind midstream. A 15-bar Italian-made pump ensures enough power plus an always-perfect temperature. The two dual-wall pressurized filters regulate interior pressure, making it perfect for beginners. You also have the option to switch filters once you’re ready to experiment. And finally, a nice little indicator light reminds you when it needs to be cleaned. As far as the tase goes, Perfection. 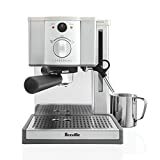 The Breville Barista Express BES870XL Espresso Machine consistently gives you an outstanding espresso shot. Of course, you always need to start the process with fresh, perfectly-roasted whole beans. Then let this steel barista’s conical burr grinder, air-tight hopper, and precision grind doser give you with a flawless foundation. Building on that foundation, the water filter, stainless water path, and pre-infusion function make your espresso rich and smooth. You’ll never end up with espresso that’s sour or bitter like you find at some big chain coffee shops. The many options allow you seemingly endless ways to experiment with your caffeinated cup, or simply the ability to find exactly what you like and expect perfection every time. 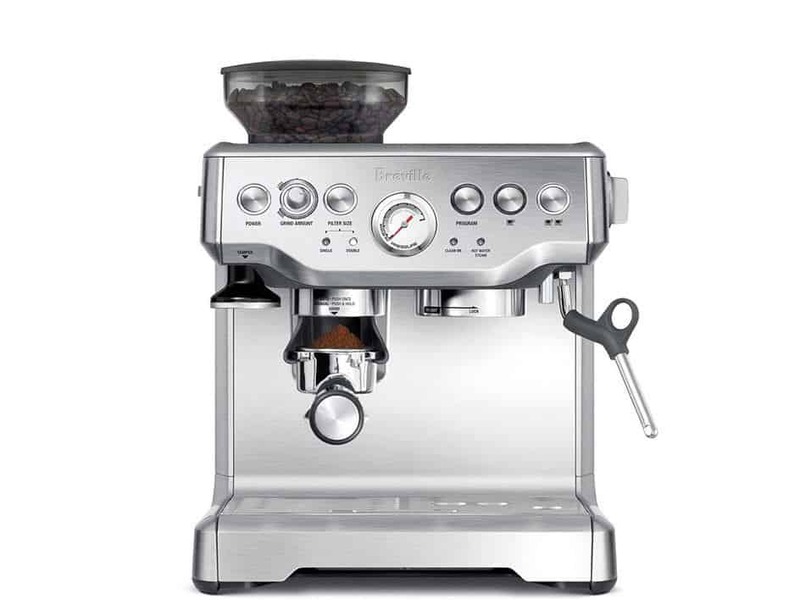 We give the Breville Barista Express BES870XL Espresso Machine a super high rating. This attractive, user-friendly machine gives you a delicious espresso for an exceptionally reasonable cost. It definitely rivals other automatic espresso machines in the $3000 price range. The bottom line is that you will get a top-of-the line brewing experience with minimal fuss. You almost just can’t go wrong with the Breville BES870XO Barista Express! Why This Get’s A High 90 Out Of 100 Rating! Breville is hands down one of the best homebrew coffee machine makers. They may not be able to keep up with a 150 cup a day super machine but the handful of cups they do make a day are definitely the best cafe quality. 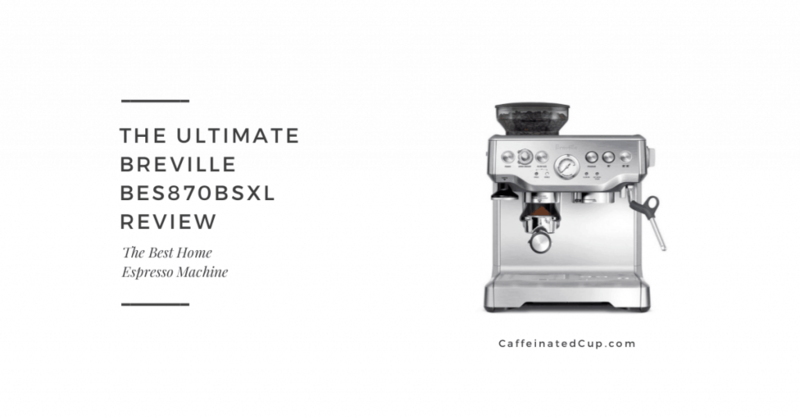 The Breville BES870BSXL is a great machine for someone who is passed the automated coffee making options. We have played around with this machine A LOT, and yet to find a better homebrew option. It has a huge range of features but still simple enough to make crazy good coffee without being a legit barista! Bottom line, if you are looking for the best machine around the mid-range $500 mark, this is it! The speed! This machine is fast! The no-slip feet keep it from jumping across the counter during grinding. The quality, stainless exterior is super sturdy and looks high-end on your coffee bar, plus it’s easy to clean (and comes with all the cleaning accessories). Mostly, this machine makes espresso easy for those who want to keep things consistent and simple. It has myriad multiple options for the coffee explorer who likes variety and adventure. All-around, this Breville Barista Express has more perks and brews better espresso than more expensive machines. The drip tray fills up quickly, and the grinder sometimes sprays on the counter, so it can make a mess when in use. There is also a cleaning warning light that comes on every 2-3 months that will warn you to clean the machine. This can get annoying as you do need to buy some de-scaling tablets to clean the machine. The Breville BES870XL Barista Express Espresso Machine comes in around $530 (less if you want to opt for a different color or happen to be a savvy shopper). 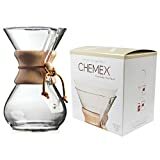 Compare this to $2400 to $3000 for other machines with comparable features, or to $1200+ a year if you make a daily stop at your local coffee shop on your way to work. 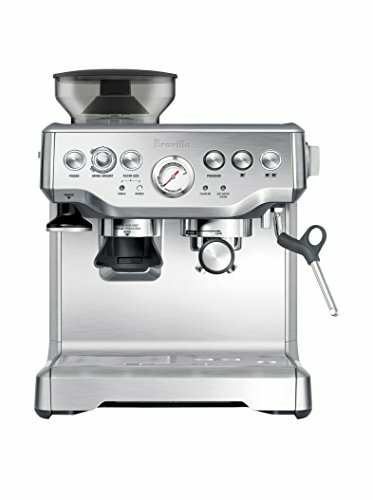 Note that Breville do make a range of models. The composition, quality, and amenities on this espresso maker will give you a great cup and save you cash. We hope you enjoyed our write up review of the Breville Barista Express BES870XL Espresso Machine! It is definitely one you should consider if you are in the market for a new coffee machine. Let us know in the comments below what you think about this machine, or share this review with someone who is looking for a new coffee machine!